The Yellow Flycatcher – or Little Yellow Flycatcher – as it is sometimes called, is a small, active warbler-like flycatcher with olive-yellow upperparts and bright yellow underparts, and conspicuous dark eye in centre of plain face. The bird occurs from Tanzania e.g. in the Tanga Region in the Handeni District in the Magambazi Forest Reserve north to Kenya (e.g. Diani in the coastal province) to the Arabuko-Sokoke Forest south of Malindi. The Arabuko Sokoke Forest is a remnant of the former extensive coastal forests in East Africa, Kenya. 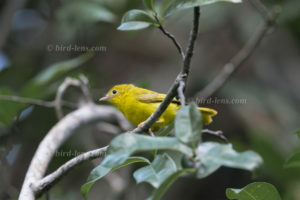 The Yellow Flycatcher has a superficial reminiscence to a female Yellow Warbler (Dendroica petechia) of North America. It is also brightly colored and lacks any breast streaking. Its next relative might be the Livingstone’s Flycatcher (Erythrocercus livingstonei) of south-eastern Africa. To cope with the growing demand for top shots of the rarer species of the Palearctic Bird-Lens is keen to enrich the range of pictures of birds you can find; and this not only in the Western Palearctic. Beside the image of the blog you can find a nice selection of birds in the gallery or in the “Picture Shop” very soon. Just give a message, if Bird-Lens.com could serve you with an image needed before the new pictures are online.